•	Implementation/designation of MCZs should be evidence-based. •	There is very little evidence that MCZs work in temperate sediment dominated areas for fisheries management or biodiversity. •	It is not clear what the purpose of the proposed MCZs in temperate sediment areas are and how they will impact on the fishing industry or biodiversity. •	There is a need for better consideration of co-location possibilities. •	Lack of certainty leads to heavy discounting of the future by fishermen and ineffective management/poor cooperation. •	Time should be taken to get our coastal marine management strategy right rather than implementing broad-scale and ineffective measures based on gut-feeling. Figure 1: Activities in the Holderness Coast area (From Bridlington to south of Spurn Point). Red areas a current and planned windfarms. Yellow areas represent three of the proposed MCZs in the region. Blue areas represent those left over that fishermen would be able to fish if MCZs evolved to become no take zones. The blue line represents the voluntary separation between trawlers and potters. Prepared by Mike Cohen, CEO, Holderness Fishing Industry Group. I am a lecturer in Marine Environmental Science at the Centre for Environmental and Marine Sciences (CEMS), University of Hull. This unit specialises in field based science has 8 full time academics, about 150 undergraduate students and 12 postgraduates. It currently has research income of around £1 million from a variety of sources including the EU, NERC, Leverhulme and from consultancy work. I was appointed to the NEIFCA because I have a research background in crustacean biology and ecology and a long-standing voluntary relationship with the Holderness Coast Fishing Industry. Over the last 10 years I have supervised 4 postgraduate students who have worked closely with the industry to better understand their social relationships, the biology of their target species and the interactions between fishers and offshore developers. I have also worked with local fishers to better understand the impacts of fishing on the animals and to gauge population fecundity. I and the HFIG CEO, Mike Cohen, have encouraged the industry to look to the future and to put compensation from the offshore renewable industry towards future proofing themselves against new pressures on their grounds. To that end they have purchased a research vessel (the Huntress) and are looking to establish a lobster hatchery. As a scientist I look for evidence-based approaches to conservation and management and personally I care deeply about coastal fishing communities and the industry. Eventually, I would like to see fishing communities put in charge of managing their own resources inside a sensible legislative framework. •	Given the lack of adequate evidence in support of most sites, even those that have made it as far as designation in the first round (Brown et al. 2013), I welcome the caution with which the current government has approached this matter and their emphasis on socio-economic factors. •	There is very little evidence to support the use of protected areas on temperate soft sediment fishing grounds for (Bloomfield et al. 2012, Caveen et al. 2012, Coleman et al. 2013). •	The fishing industry has struggled to adequately represent itself in the face of a barrage of slick PR and misinformation from celebrity activists and well-funded and idealistically driven NGOs. Together with the incoherent and devolved approach to the development of the MCZ network (Brown et al. 2013, Oliver 2013) this has resulted in a skewed picture of the industry and the efficacy of MCZs. •	I think that the estimated £8 million spent on the consultation process has unfortunately not resulted in a science or evidence-based set of proposals for the development of MCZs. It has resulted in a rather nebulous cloud of information. •	The economic impact data are vague and not evidenced. Some of it I just do not believe, e.g. the suggestion that the impact of the Swallow Sands site on fishers will amount to a mere £9000. •	There is a lack of detail with regards to what each of the proposed MCZs will actually mean in terms of restrictions or conservation objectives. Before implementation each MCZ should have a clear purpose and it should be clear to stakeholders with an economic interest exactly what that could mean for them in terms of restricting their activities. •	For the Holderness Coast Inshore area I note that there is a novel suggestion that undisturbed benthic sediments are good for combating pollution. There is no evidence given to support this statement. 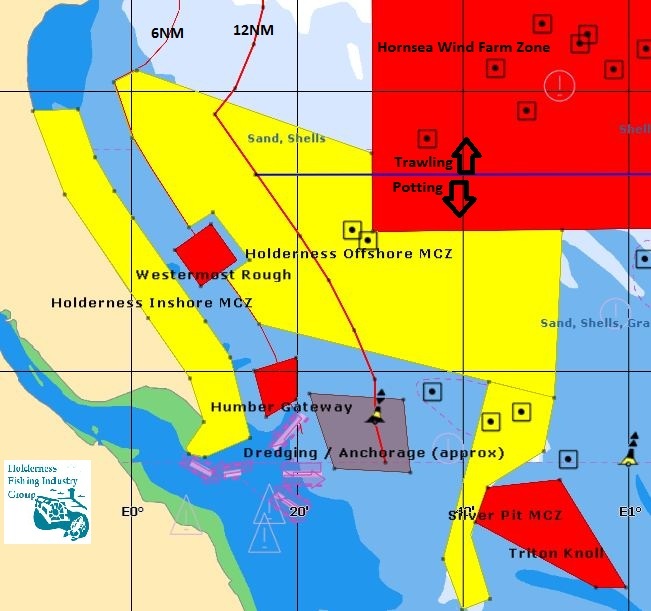 •	In the Holderness Coast area the renewable sector carves obvious chunks out of MCZs (Figure 1). Each windfarm is in effect an exclusion zone where fishing boats will not be able to work because they will not have insurance cover and because, in the event of an incident, air-sea rescue will not be able to work inside turbine areas. Far more sensible would be to compromise and co-locate MCZs and windfarms, thus reducing the impacts of displacement on the fishing community and “unprotected” areas. •	There is a suggestion that there is a need to consider the impact of surrounding areas on MCZs and that there may need to be ancillary action/legislation in non-MCZ areas. However there is no recognition of the potentially negative impacts that designation of MCZs will have on the rest of the environment. If there are restrictions on activities in MCZs, fishermen and developers will likely concentrate their activities elsewhere which will lead to conflict and overexploitation. Rather than a broad footstep, lightly trod, with appropriate measures for each area and fishery, we could end up with unfished and heavily fished areas. This will lead to issues over comparable assessment of MCZs v other areas (Field et al. 2006). •	Trenching activities for pipelines, aggregate extraction, gas cavern development and windfarm surveys and construction have already impacted on traditional fishing grounds in the North Eastern area. The view appears to be that MCZs are not likely to be problematic because the oceans are endless and fishermen can always move somewhere else. This is not the case. •	Each of these impacts increases the discounting rates of fishermen (i.e. increases their insecurity with regard to the likely potential to continue to make a living from fishing in the future) and detracts from the likelihood of successful local management. The likely imposition of MCZs against the will of the fishing community and in an evidence vacuum adds to the perception within the industry that the fishing community continues to be marginalized and that they have no secure rights to commons that they have been exploiting for generations. •	Despite the various challenges facing the industry, fishermen in the North East IFCA region remain staunchly in support of actions that will enhance the sustainability of their industry. They have supported an increase in the minimum landing size of lobsters and a ban on landing “berried hens”, they have voluntarily v-notched tens of thousands of low-value or undersized, soft, damaged or oversized lobsters so that they cannot be landed until they have moulted several times (Rodmell, unpublished manuscript). The Holderness Fishing Industry Group has recently invested in a research vessel that they will use to look at problem areas that developers and the IFCA have not investigated and explore options for diversifying the activities of the fleet. They also plan to build a lobster hatchery in Bridlington to supplement the local population, something they believe has enhanced catches in the past (Bannister et al. 1994). •	There appears to be an irrational rush towards development of further MCZs, championed mainly by NGOs (Caveen et al. 2013). In the stampede the argument has become MCZs v no MCZs rather than “how can we best maintain the ecology and economy of our seas”. •	Our fishing grounds have survived decades of exploitation and there has been a significant decrease in the numbers of inshore boats around the coast of England since the 1980’s. There is surely time to take a scientific approach to such a big change in the management of our oceans, rather than moving towards destroying an industry because there is a gut feeling that one simplistic approach is the right one. There is no single approach to fisheries management that works in all situations – there is no panacea (Ostrom et al. 2007). We need to always bear that in mind – complex problems require complex solutions (Folke et al. 2012). •	The way to encourage sustainability and good governance is to develop certainty amongst the main stakeholders, the fishing communities, that they will still have access to their historic resource rights in the future. There is a need to refocus attention on the knowledge and data that fishermen and communities have (Johannes et al. 2000). Fishing communities and businesses where knowledge of their grounds equates to income will be slow to share their deep understanding of their areas when their local ecological knowledge is ignored/mistrusted and their views are taken as secondary in importance to those of a celebrity cook and well-meaning but misguided NGOs. Brown C, Hull S, Frost N, Miller F (2013) In-depth review of evidence supporting the recommended Marine Conservation Zones Project Report Version ( Final Report ) March 2013. Oxbridge should take applicants with the most potential, not the most appropriate backgrounds. A few years ago I had a summer scholarship at St Johns College, Oxford University. It allowed me to concentrate on research and use the fantastic shrimp collection at the Oxford University Natural History museum. It was probably a once in a lifetime experience and something I treasure – 6 weeks of working in the dreaming spires of Oxford rather than the rather less dreamy bungalows of Scarborough Campus, Hull University. St John’s is a world apart from my day to day experience of teaching and researching in University for the last 10 years. Even though some college tutors at Oxbridge can have fairly heavy teaching loads they are working with very good students. Many of my students in the Centre for Environmental and Marine Sciences, are also very good, but they tend not to be from public school, some of them even have regional accents! It is fairly unusual for us to have straight A students, but I have learned over the years that often A level results are not an infallible indication of potential or ability. Many of our students are, as I was, the first in their family to go to university. For many the simple aspiration was just to get to university, any university. Many had, for one reason or another, a disaster in their final A-level year caused by poor schooling, lack of support, illness, the need to work or just hormones. Also of course you have to remember that they are generally not at fee paying schools where kids come from an atmosphere where reading a book is the norm and families discuss current affairs around the breakfast table. Even if you are an able student your peers are likely to be a mixed bag, some with the normal sorts of social problems non-privileged kids might have. Teachers at their school may have to invest as much in crowd control as teaching. In this atmosphere being even just a capable student can be social suicide and aspirations are likely to be more immediate than long term life goals. Expectations at schools with challenging catchments may just be to get students through in one piece and give them some sort of education. If you are a fairly smart parent, with some energy and time, you can play the system to try and give your child the advantage of a better school or move house so that you fall into the right catchment. I know parents who have bought a tumbledown second house in a good area just so that their kids can go to a better school. But many parents don’t have the desire, ability, finance or energy to help their kids get into higher education. If by some miracle a child or young person manages to be the 1 in 10 or 20 that makes it to university from their challenged school, they are special. They have demonstrated determination, drive, an ability to challenge the social norms of their local culture to succeed and intelligence. Unfortunately I think many of those characteristics don’t translate directly into A* A-levels. These folk have also not had the advantage of coaching in getting through entrance examinations or interviews. They will not be comfortable in the atmosphere of an upper class establishment with oak panels, hundreds of years of history and received pronunciation. They will not be practiced in vocalising their thoughts. They are not expected to go to a particular college to study a particular topic. When they are interviewed by Oxbridge dons they are likely to falter, mumble, look away. They will, while being put through a completely alien process, wonder why they are putting themselves through it when everything around them is telling them they would be more comfortable at a red-brick establishment, probably studying something “practical”. I asked some of the academics in St Johns about the poor levels of entrance of non-public school kids to Oxbridge generally and got the response that “we do try they just don’t seem to do well in our entrance system, they don’t have the confidence and can’t show us their ability. It’s a terrible shame”. At the time, I just thought “Oh well, such is life” but over the last few years I have changed my mind. These are publicly sponsored institutions that have a duty to find the best people and give them the best possible education. They should not be taking the best prepared people who naturally feel it is their right to go to Oxbridge, those who come from the correct background. Over the years I have noticed that as you progress through the ranks of academia, at least in red-brick institutions, there is a form of natural selection and the proportion of private school educated people around you drops precipitously. This could be of course because I work in science rather than art and posh people generally don’t do science. But I like to think it is a reflection of ability, eventually, trouncing background. It makes me think though that the Oxbridge type institutions are missing the very best students. Ben Goldacre (author of Bad Science and Bad Pharma) recently wrote a report for Michael Gove that suggests ways in which policy in education could be driven by research rather than whim. Entrance to university, the mechanisms of selection used and subsequent progress of students from a variety of backgrounds would to me seem to be one area ripe for investigation. The onus should be on Oxbridge to develop their entrance systems to actively seek out the best students and traditional entrance exams and interviews may not be the best mechanism. These institutions should be reaching out to communities and going into schools to talk to teachers and students on their own terms, finding the good ones and begging them to come to their university. Peter Wilby in the Guardian suggests that Oxbridge should identify the most able students in each school and give them every possible support. He identifies interesting consequences for the attitudes of middle class parents towards schools in deprived areas. Until the ratio of public:privately educated students entering these Oxbridge type institutions matches that of the general populace they will continue to be assessing applicants on the basis of class rather than potential. To me the use of taxpayers’ money to teach a socially cleansed student population, to artificially enhance the opportunities of those that already have them in abundance is immoral. Dr Magnus Johnson is a lecturer in Environmental Marine Biology at the Centre for Environmental and Marine Sciences, University of Hull. His thoughts are his own. Are discards such a bad thing? A few years ago I remember being challenged by a motorcycle mechanic in a pub about discards. I remember feeling quite indignant that while a mechanic could see the evils of throwing good fish back into the sea again the fisheries community couldn’t do anything about it. It seems blindingly obvious that discards are a bad thing. However, I’m a born cynic and when something is too good to be true I generally think it cant be true. Same with blindingly obvious. To many it seems blindingly obvious that MCZs are THE solution to the perceived problem of overfishing. Actually that is an example of a solution that is too good to be true. To easy. But surely discards are different? Surely the fact that they are a bad thing is an example of something that is actually true? Consider first, what are we going to do with the fish that would have been discarded. As far as I understand it at the moment, ports and markets are not geared up to deal with tonnes of poorly treated, low value fish. Consider second – what will we use it for? Maybe we can use it as fertilizer? Is that a good use of fish? Maybe we can feed it to Salmon? Feeding fish to fish seems wrong to me. Both of these options may induce high carbon costs. If it ends up as landfill that would be more illogical than continuing to put up with bycatch where at least the waste usefully feeds back into the system. It could be used as bait by static gear fisheries which could be good for that sector as this has become an increasingly expensive aspect for them. Consider third. What has been happening to discarded fish in the past? It is either snapped up by eager sea birds, such as gannets, snapped up by predators or sinks to the bottom where it forms part of the food chain for other wild fish and benthic organisms. In some parts of the world it has been estimated that 40% of the diets of lobster and crab comes from discarded fish. I have a feeling that a lot of birds are going to starve when discards are banned. We could also see some declines in fished species that need discards. Consider fourth. How will the discard ban impact on the behaviour or fishermen? If technical measures such as Trawl Exclusion Devices (TEDs) don’t work in their favour, they will perhaps target species that have low levels of bycatch. Perhaps everyone will target species with low levels of bycatch – what will the knock on effects of that be? Consider fifth. Just because something doesn’t make it onto the deck doesn’t mean it has not been impacted by fishing gear. You could design gear that was more selective but not necessarily less harmful but it would reduce “bycatch”. In order to survive the vagaries of EU management, fishermen have become adept at working around regulations and this seems like me to be an area ripe for exploitation. From a management point of view just trying to estimate bycatch has been tricky enough and that is at least visible. How will we estimate the impacts of injury to animals that are not landed? Consider sixth. What about the effects of differential survival rates of different species? The grand banks cod fishery was a victim of this because discarded dogfish survived quite well. Eventually dogfish replaced cod. It seems likely from what the fisheries minister has said that there will be investigations into which species survive discarding and I assume fishermen will not be forced to keep these. It would be, for example, extremely daft if potters had to keep all crabs and lobsters that ended up in their creels. I don’t know the precise answers to some of the above, but my point is that we need to think hard about what the effects of the discard ban might be and find sensible solutions. A translation of the original article “Fisherfolk: Conservation Refugees Reloaded” by Magnus Johnson. Quatorze millions de personnes autochtones ont été chassées de leur terre par des activités de conservation. Les peuples autochtones ont vécu sur leurs terres pendant des générations et leur comportement a généralement été déterminé par des normes plutôt que par des lois, et ce qu’ils avaient à faire pour survivre. Les gestionnaires des aires protégées sont financés par les ONG occidentales dont le comportement est déterminé par l’économie, les lois, l’idéalisme et une science superficielle. Souvent, la pauvreté est utilisée comme un argument pour « améliorer » la vie des peuples primitifs. Les peuples autochtones sont généralement considérés avec dégoût dans leur pays d’origine. Considérons par exemple comment le citoyen moyen au Royaume-Uni considère les gitans, comment les Indonésiens voient les Bajo, la maltraitance des Inuits en Amérique du Nord et le mauvais traitement des Aborigènes par les Australiens. Une grande partie de cela est lié à la façon d’évaluer les biens. Les peuples autochtones qui vivent souvent en petits groupes, survivent grâce à la responsabilité sociale et la réciprocité, un système de valeurs souvent facilité par des liens familiaux étroits. Les conservationistes aiment le mot SCIENCE. Brockington et Igoe soulignent que, généralement, les organisations revendiquent ce mot quand elles s’efforcent d’acquérir le pouvoir et le prestige, et pour supprimer toute opposition. Le public a du mal à remettre en question les « faits scientifiques » et diverses techniques sont employées par des organisations de conservation : choix sélectif des faits à utiliser, utilisation des faits non pertinents mais qui semblent impressionnants, et ignorance des vérités dérangeantes. 1)	Ils n’ont pas de documents disant qu’ils possèdent quelque chose. 2)	Leurs ancêtres n’ont pas volé la terre des paysans par la force. 3)	Ils ne sont pas surreprésentés dans la chambre des Lords. 4)	Vous ne pouvez pas faire une thèse sur n’importe quoi à Oxford ou Cambridge en « Gestion maritime » parce que vos parents n’appartiennent pas à la bonne classe sociale. 5)	Lorsque vous prendrez votre retraite, vous aurez un corps brisé et un bateau qui vaut moins que quand vous avez commencé. La pêche est sans doute l’un des derniers métiers où l’on peut réussir uniquement à force de travail acharné et de ténacité. Récemment, nous avons vu l’application de haut niveau de la pseudo-science au monde de la pêche par un cuisinier. Souhaitez-vous demander à un pêcheur comment couper les légumes ? Hugh-Feelmy-Walletall se fait d’énormes quantités d’argent par sa harangue publique contre la pêche. ( Fishfight n’est pas un organisme de bienfaisance). Avec sa première campagne contre les rejets en mer, j’ai juste senti une légère irritation en voyant que quelqu’un qui coupe les légumes et cuit la viande a pu aller plus loin que les scientifiques, des halieutes qui se battent pour résoudre le problème des rejets depuis des années. Plus récemment, cependant, il a sauté dans le train en marche de la création de réserves marines. Quelque chose que les riches organisations de propagande telles que Conservation International et Greenpeace ne sont que trop heureuses de soutenir. Je recommande d’écouter Ray Hilborn pour apporter un peu d’équilibre face à ce déluge d’informations erronées grassement financées. Le fait qu’il n’y a pratiquement aucune preuve pour étayer l’idée que les réserves fonctionnent dans des zones tempérées, en particulier sur des sédiments mous, semble avoir été complètement ignorée. Le gouvernement et les gens les plus éclairés s’accordent pour dire qu’il y a un manque total de preuves pour soutenir la mise en place de la plupart des réserves proposées et certains travaux qui suggèrent leur prédominance en tant que paradigme de l’écologie de conservation est fonction de l’idéologie plutôt que de la science à l’état pur. Les gens ordinaires aiment croire que si vous laissez faire, les choses iront mieux et le monde retournera à un état mythique d’Eden – « l’illusion du paradigme de l’équilibre ». La conservation réelle et positive / la gestion de la ressource, nous obligent à examiner les choses plus globalement plutôt que de s’intéresser à des espèces particulières et de tracer des courbes sur des graphiques . Comme Ostrom le disait , les situations complexes exigent des solutions complexes- il n’existe pas de solution unique, pas de solution miracle. Comme Beth Fulton l’a dit lors du dernier Congrès Mondial des Pêches, « nous devons avancer avec prudence et à grand pas ». Chasser les pêcheurs des zones où ils ont pêché pendant des générations, afin de soulager les consciences de la classe moyenne, de hippies intellectuels en sandales, n’est pas la réponse. Regardez cette carte (fournie par Marc Cohen, de Holderness Fishing Industry Group) et voyez sur quelle étendue cette zone sera interdite aux pêcheurs. En conséquence, on pêchera de plus en plus sur une zone réduite, de manière non durable, étant donné que la pêche est de plus en plus étranglée. Il n’existe aucune preuve d’un effet réserve (spillover effect) susceptible de se produire dans ce secteur. Notez comment les réserves contournent les exigences de l’industrie énergétique (nouveaux acteurs sur le terrain) mais pas celles des pêcheurs « arriérés ». Les pêcheurs sont susceptibles d’être les nouveaux réfugiés de la conservation, et si les extrémistes arrivent à leurs fins, il y aura une plus grande marginalisation, des pertes d’emploi, et la pauvreté dans les villes et les villages côtiers au Royaume Uni. Dans les plus jolies, il y aura les résidences secondaires de la classe moyenne fuyant la ville, envahies l’été, couvertes de plantes sauvages, et dont les magasins seront fermés en hiver. Bien que mes ancêtres étaient pêcheurs et chasseurs de baleines, je ne suis pas aveuglément pro-pêche, et je ne suis pas anti-écologiste. Je suis juste anti-bêtise. Dr Magnus Johnson est biologiste marin au « Centre for Environmental and Marine Sciences ». Son texte n’engage que lui. I was recently asked to comment of an paper published in the Journal of Experimental Biology that proported to have discovered that crabs feel pain. The paper by Magee and Elwood demonstrates that if you apply a shock to a crab in a shelter it moves away and avoids returning to that location again. I’m not that impressed with the paper as you could just read it as “if you apply a potentially damaging stimulus to a crab it will move away”. Not quite what was reported. I am in effect parroting a previous piece of work Eugene Balon who really made me think a few years ago about how we treat fish. I was also informed by another very reent, excellent and thoughtful paper by Rose et al which suggests that we have not yet proved that fish can feel pain. I grew up in the Shetland Isles, a place that at the time was dominated by fishing. I saw millions of fish being casually tossed onto the quayside and in my head they were like vegetables. Whether they feel pain or not just never occurred to me, they were just fish. When I went Aberdeen University to study for a Masters in Marine and Fisheries Biology, I worked in a lab where blood samples were routinely extracted from fish – the research group was primarily interested in the immune system of fish. In order to take just a small blood sample from a fish the lab needed several home office licences and people had to attend training courses where they were acquainted with the law and allowed procedures. Quite the opposite approach to fish that a fisherman might take. I considered the extremes to which labs had to go quite excessive. These fish were treated very well and minimal amounts of pain or stress were imposed on them whatever procedures were being carried out. A few years later, I got involved in the UK Shark Tagging programme. In the field of angling and and science the law in Britain becomes completely bizarre. It is perfectly legal for a fisherman to catch a shark and leave it to asphyxiate on the deck of a boat. He or she can gut it live if they want. If you are an angler or a scientist involved in a tagging programme, where the angler (or scientist) treats the fish with extreme care, gently brings it alongside the boat, tags it with a streamer tag, gives the fish time to recover and then lets it go, technically they are breaking the law. I stand by my feeling that whether animals feel pain or not is irrelevant. To damage or stress a living organisms for no reason other than to enjoy their struggling and suffering is like taking a hammer to a Ferrari or slashing the Mona Lisa. It is an act of pure mindless vandalism.